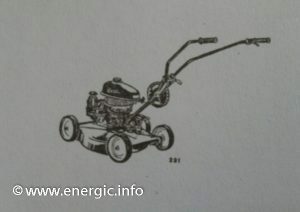 Energic Tondeuse available in 5 variants this being a Eglantine Super with a Briggs & Stratton.- rare example. 1). Primevere; Moteur Aspéra, 2 temps, 2.5cv @ 3800 rpm, cylinder 83.7cm3, body/carter tôle, width of cut 39 cms, height of the cut is regulerable. 2). Eglantine Super; Moteur Briggs and Straton, 4 temps, 3.5cv, body/carter tôle, width of cut 45 cms, height of the cut is regulerable. Previously the Eglantine model had a 3 cv @ 3600 rpm, 127cc, 4 temps, Aspera moteur with a width cut of 52 cms. 3). Pervenche; Moteur Sachs, 2 temps, 2.5cv, body/carter tôle, width of cut 45 cms, height of the cut is regulerable. 4). Jacinthe; Moteur Aspéra, 4 temps, 3.5cv, body/carter tôle, width of cut 58 cms, height of the cut is regulerable. Engine/moteur propelled. 5). Orchidee; Moteur Bernard, 4 temps, 4cv, body/carter alloy/alliage resistant to shocks, width of cut 53cms, height of the cut is regulerable. Engine/moteur propelled. All 5 models have a back box/sack for catching the grass/herbe, with the cut being regularable between 2/4 to 6 cms. Energic Tondeuse available in 5 variants. Also the Motobineuse Rubis with a Briggs & Stratton moteur variant could be transformed into a Tondeuse, with the right adaptions. 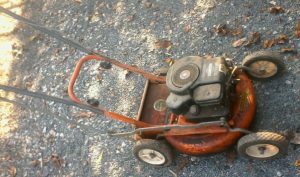 Motobineuse Rubis with a Briggs & Stratton moteur variant. 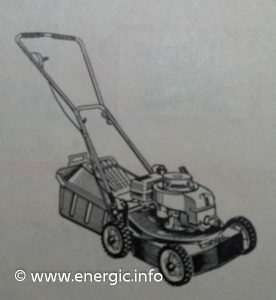 Able to cut a width of 53cms and grass height 2 to 8 cms. (in a normal working environment). 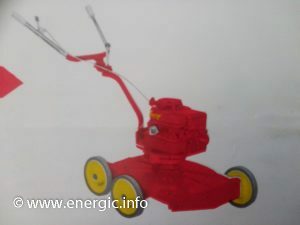 See more about the Energic Rubis models here.